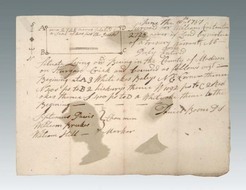 Autograph Letter Signed; Boone (Daniel), 1787, Regarding Land Survey, 8 inch. An autograph letter signed by Daniel Boone; image credit on full record. A detail of the signature on an autograph letter signed by Daniel Boone; image credit on full record.